Welcome back to “Brewers By the (Jersey) Numbers”, my annual countdown to Brewers Opening Day by way of the numbers being worn in Spring Training by 40-man rosterees and many non-roster invitees as well. Last night on Twitter, I asked the masses whether or not they’d want today’s column to even be written given that there isn’t exactly a whole lot to discuss. The responses were mixed, but I decided to do it anyway because he’s still on the 40-man roster today and there’s at least something to discuss even if it isn’t how I think he’ll perform in 2013. That said, this will be a fairly short post. First of all though, this time last year Mathew Lawrence Gamel was finally getting his shot. Prince Fielder followed his wallet to Detroit (don’t infer bitterness from that), and there was a wide-open position at first base which just so happened to be a position Gamel had spent some time learning in the minors in 2011. It’s almost like someone was anticipating Fielder’s departure. Zany idea, I know. Gamel had an okay Cactus League in 2012, displaying some power be dropping six “Matomic Bombs” (a phrase I coined for the occasion of a Gamel home run) despite only hitting at a .238 clip with a .324 on-base percentage. Still, he came to camp healthy and in the best shape of his life after re-dedicating himself to his craft in the preceding off-season. Opening Day 2012 came and Gamel trotted out in the starting lineup for the first time in his career. (“I remember…because I was there.”) Gamel went 2-for-4 that day with a run scored and everything was off to a great start. Gamel would make it through the month of April, posting a .246/.293/.348 slash line. He totaled 17 hits, four of which were extra-base hits (sadly only one home run though), and 15 strikeouts in 69 AB. He walked four times, scored 10 runs, and drove in six. May was far less kind. Playing in San Diego, Gamel was chasing hard after a foul ball when the ACL in his right knee would give out. Gamel crumpled to the field and the worst was immediately feared by Brewers fans. Gamel was done for the year and had surgery on May 22nd to repair the injury. Guys like Travis Ishikawa and Taylor Green would fill in at first base for a little while but eventually the move was made to have Corey Hart fill in there as the regular starter. Gamel worked hard at his rehab and, by all accounts, was healthy and exactly where he should have been as late as when he first reported to camp. His knee went through a normal checkup and graded out fine. The other good news for Gamel on a professional level was that the man who took over at first base was going to be missing the first month or so of the regular season so Gamel had a starting job waiting for him again. Then, the unluckiest guy had another black cat cross his path. He began working out at camp but was scratched from team workouts one morning after he tweaked his knee. It was on February 18th when manager Ron Roenicke delivered the news that Gamel’s surgically-repaired ACL had suffered what is known as a “failure”. ACL repairs do fail around 10% of the time in life anyway, but Gamel’s was of particular peculiarity because the ligament didn’t re-tear at one end or the other but in the middle. It just snapped in two. What happened to Gamel is rare. His 2013 is over before it ever truly began and his months-long rehabilitation of his knee was for naught. He had to start over and is ironically scheduled for surgery today to again repair his knee. Gamel was in unexpectedly calm spirits in the days following the injury. He knows it happens and that it was unlucky but he realized that being upset about it wasn’t going to help him overcome it. But the bottom line for Gamel’s career is that his time in Milwaukee as a Brewers might end when he’s given a clean bill of health. 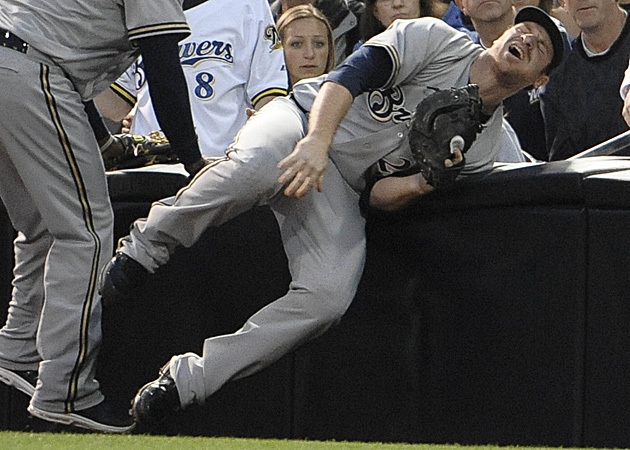 After the 2013 season, Mat Gamel becomes eligible for arbitration. A player’s first year of arbitration eligibility sees a significant spike in salary. There have been many players over the years non-tendered in this situation. Their performance and production simply don’t warrant the salary for a team with a relatively limited budget like Milwaukee. So, after years of being unable to breakthrough or stay healthy enough, Gamel could be jettisoned and forced to sign a minor league deal with another club in order to prove his health and his ability to contribute in an entirely new environment with an entirely new organization. There are some fans who won’t mind that and others will probably cheer it, but the fact remains that all Gamel did throughout his minor league career was hit. He was the organization’s top prospect for a couple of years but simply couldn’t put it all together. If Gamel returns to Milwaukee, I would think it would be under the circumstance of a very small raise, something Gamel would have to agree to. Furthermore, Gamel’s role on this team as a starter is probably done. Even if Hart leaves in free agency after 2013, the Brewers have a possible replacement in Double-A Southern League MVP Hunter Morris — who will be starting the year in Triple-A Nashville — to consider for the job as well. Just something to keep in mind going forward as the 2013 regular season gives way to the 2013 postseason. Shortly after the morning team meeting today at Brewers Spring Training, Ron Roenicke addressed the media and told them that Mat Gamel is “probably going to miss the season” due to a re-tear of his surgically-repaired right knee ACL. There will be no “matomic bombs” hit at Miller Park this year, Tiny Tim. This comes as a bit of shock in a couple of ways. First and foremost, Gamel had good checkups on the knee both when he was in Milwaukee for “Brewers On Deck” last month, the team’s annual winter fan fest, and again just last week at down at Maryvale. Secondly, the failure of the repair occurred in the middle of the ligament. Repairs fail around 10% of the time, but if they do happen it is usually at one end of the ligament or the other. The Brewers head physician, Dr. William Raasch, explained the failure scenario to team officials and then assistant GM Gord Ash relayed that assessment to the media. From here, Roenicke told the media that Doug Melvin’s plan is to review internal options first. That means a longer look for Taylor Green, perhaps more looks for Alex Gonzalez and Martín Maldonado, an a more significant look at Brewers 2012 Minor League Player of the Year and Southern League MVP Hunter Morris. Another name you’ll see in the box score on the big league side now is Sean Halton who started at 1B for the Nashville Sounds last year. To that end, Gord Ash told Brewers.com beat writer Adam McCalvy that Hunter Morris “will be a strong candidate” to play first base at the start of the season. There are a couple of unsigned free agents with first base experience in Carlos Lee and Aubrey Huff, but there is doubt that either would want to come to a situation where they’re basically guaranteed to lose the job as soon as Corey Hart is healthy enough to return. Other externals options include recently DFA’d players. Mike Carp and Daric Barton fit that description. What would you do, Brewer Nation? In many conversations I’ve had over the past several days about the Brewers roster composition, backup first baseman was of particular interest. Following Corey Hart’s knee surgery, Mat Gamel was promoted from his assumed role of reserve first baseman — along with third baseman and corner outfielder — back to the starting first baseman’s job he held last season when the team headed north after Spring Training. The initial talk was about how quickly Hart could and would return. Then it moved to whether Gamel was a capable starter for the span of time Hart would be missing. 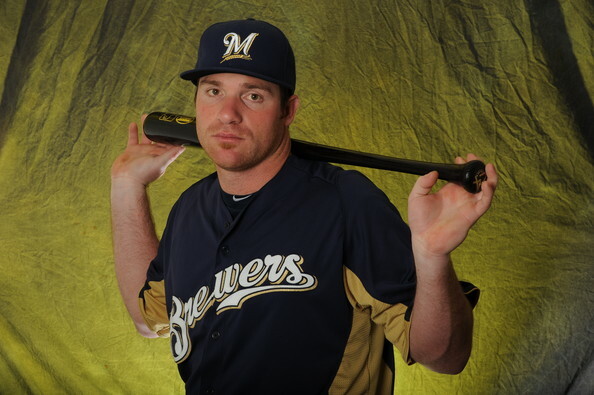 Soon though that the Brewers didn’t have an official backup first baseman anymore was quickly realized by many fans. First, the Brewers openly courted former Brewer Lyle Overbay, but to no avail as he signed a contract with the Boston Red Sox. More quietly they were interested in Juan Rivera who logged time in 54 games at first base for the Los Angeles Dodgers last season. Rivera agreed to a free agent contract with the New York Yankees instead. This sent up some flares signaling that the Brewers didn’t outwardly appear all that interested in heading to the season with the relatively inexperienced (and left-handed hitting, like Gamel) Taylor Green as the primary backup. 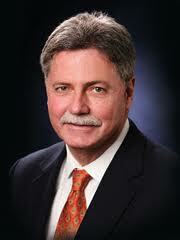 Talk moved to Hunter Morris and whether he would be given a chance to compete for the job. I’ve done my best to point out that Morris isn’t even on the 40-man roster this year and it would be extremely out of character (and in my opinion foolhardy) to waste an option year and start Morris’ arbitration clock for the time which Hart would miss. And that was to the people who were suggesting Morris as the starter over Gamel. To those who think they’d burn the same to make use of Morris as a backup, all I can say is that I don’t exactly foresee that either. With all this talk, I reached out to a source about the role and it was suggested to me that backup catcher Martín Maldonado could be the man to fill in against some lefty starters in Gamel’s stead. The source went so far as to say that Maldonado was told specifically to get a first baseman’s glove to bring Spring Training. To that end, Maldonado is on record as saying that he enjoyed the time that he got to play first base last year. One potential problem is that it is quite unlikely that Maldonado will see any reps at first base while away at the World Baseball Classic — where he will back up Yadier Molina for Team Puerto Rico — so he’d miss that time. Plus, as his time with the Brewers will be limited overall this Spring, Maldonado will likely be called on to catch plenty when he is with Milwaukee so he can develop his rapport with his new pitchers and reestablish the bonds with the returning Brewers hurlers. Still, it would make sense if Maldonado is up to the task. He surprised most people with his offensive numbers last season and played passable-at-worst defense at first when called on. So basically, keep that in mind when and if you see Maldonado’s name start popping up in Cactus League boxscores with a “1B” near it.